Man don’t you just hate this? Being forced to ask the “what if” question repeatedly and make calculations, in order to find out your team’s chances of qualifying? And to think that all could be avoided simply by winning the first two group games. As you can tell from the table, Netherlands have already clinched their qualification and are mathematically guaranteed of ranking 1st. Romania, France, and Italy are therefore left to contend 2nd spot. NETHERLANDS	 FRANCE	 FRANCE	 (points)	 . by 2 or less	 scoreless draw	 ROMANIA	 d) Goal difference in all the group matches	 . by 3-0 or more	 scoreless draw	 ITALY	 f) FIFA/UEFA coefficient	 . by 4-1, 5-2, etc. scoreless draw	 ROMANIA	 e) Nº of goals scored in all group matches	 . NETHERLANDS	 draw with goals	 ITALY	 c) Goals scored in ROM / ITA / FRA matches	 . NETHERLANDS	 ITALY	 ITALY	 (points)	 . draw	 FRANCE	 FRANCE	 (points)	 . draw	 draw	 ROMANIA	 (points)	 . draw	 ITALY	 ITALY	 (points)	 . ROMANIA	 FRANCE	 ROMANIA	 (points)	 . ROMANIA	 draw	 ROMANIA	 (points)	 . ROMANIA	 ITALY	 ROMANIA	 (points)	 . Scenarios 2, 3, 4, and 5 deserve some further explanation. In this scenario, Romania, Italy, and France end up with 2 points each and with identical goal differences and goals scored (when considering only the France vs. Romania, Italy vs. Romania, and France vs. Italy matches). Thus, the 4th tie-breaking criterion (d) applies and ROMANIA qualifies based on their better global goal differential. Once again Romania, Italy, and France end up with 2 points each and with identical goal differences and goals scored (when considering only the France vs. Romania, Italy vs. Romania, and France vs. Italy matches) and also identical goal differences and goals scored globally in group C. Thus, the 5th tie-breaking criterion (f) applies (FIFA/UEFA coefficient from World Cup 2006 and Euro 2008 qualifying campaigns: points obtained divided by the number of matches played), which sees ITALY ranked higher than Romania and France. In this scenario, Romania, Italy, and France end up with 2 points each and with identical goal differences and goals scored (when considering only the France vs. Romania, Italy vs. Romania, and France vs. Italy matches). Thus, the 5th tie-breaking criterion (e) applies and ROMANIA qualifies based on their higher global number of goals scored. In this case, Romania, Italy, and France end up with 2 points each and with identical goal differences (when considering only the France vs. Romania, Italy vs. Romania, and France vs. Italy matches). However since Romania vs. France ended 0-0, and because of the goal they already scored vs. Romania (on matchday 2), any goal scored in the match vs. France (matchday 3) puts ITALY above the lot for the 3rd tie-breaking criterion (c). I’d just like to say I spent a fair amount of time researching this, so technically I should have gotten everything right. However feel free to point out any mistakes and/or ask questions if you need further explanations. 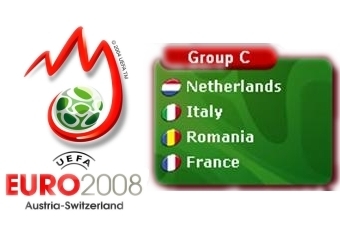 This entry was posted on Saturday, June 14th, 2008 at 9:29 am	and is filed under Azzurri, Euro 2008. You can follow any responses to this entry through the RSS 2.0 feed. Both comments and pings are currently closed. Great post. It’s simple to understand when you lay it out like you did. brilliant breakdown mate – the work on that is exhaustive and well researched. I would love to see an Italy v Spain quarterfinal. And a Dutch v Russia quarterfinal coming out of these groups. You’ve hit the scenario’s almost completely right I think. Except for one minor almost unsignificant detail: the uefa-coefficient will only count if the NED/ROM game ends exactly 3-0. If it might end in 4-1; 5-2; 6-3 etc. Romania will go through on goals scored. If the goal difference is greater of course, Italy goes through. You are absolutely correct Johan, thanks for pointing it out.